Transfer of genes in utero via the amniotic fluid was shown previously with recombinant adeno-associated viruses (rAAV) to be highly efficient. Expression for over one year was demonstrated using reporter genes. In addition, it was shown previously that transgenes delivered by this method release protein into the general circulation. Given these results experiments were designed to test the hypothesis that in utero rAAV gene therapy could result in long term physiologic modification. A rAAV recombinant expressing ciliary neurotrophic factor (cntf) and green fluorescent (gfp) in a polycistronic messenger was used to treat rat fetuses in utero. CNTF causes weight loss and decreased water consumption as a measurable physiologic effect. GFP was used as a marker of gene expression. In utero gene transfer with rAAV carrying human cntf and gfp resulted in long-term gene expression in rat. CNTF-specific physiologic effects of a decrease in weight and water intake were obtained. Expression of the GFP was documented in the treated animals at one year of age. Given this data, in utero gene therapy with rAAV into multipotential stem cells resulted in long term systemic physiologic modification of the treated animals by the transgene product. In utero rAAV gene therapy potentially could be used for gene replacement therapy in metabolic disorders. In utero gene transfer is a successful method to transfer genes to the developing fetus. Providing a therapeutic gene to the developing fetus allows for the treatment of genetic defects before the comorbidities of the disease results. Many genetic diseases can be detected in utero; therefore, treating these diseases prior to birth could prove beneficial. The fetus provides a unique environment for gene transfer because we can influence differentiation and proliferation of target cells and in addition we are able to bypass the immune system because our vectors are not seen as foreign in the immature immune system of the fetus . Our laboratory has proven that in utero gene transfer via amniotic fluid is an effective method to introduce genes into multipotential stem cells into three species; the mouse, the rat and the rhesus primate [2–6]. Gene transfer is performed at 16–17 days gestation in rodents, which is comparable to that of a 10–20 week human gestation. During this critical time of development, undifferentiated epithelial cells line the lung and intestine. These cells are the targets for our vectors. Organ development and growth continues after the infection and the differentiated daughters of the targeted cells continue to express the transgene. The vector used in this experiment was adeno-associated virus which has shown much promise as a gene therapy tool [7–9]. Adeno-associated virus is a nonpathogenic parvovirus which consists of single-stranded DNA molecule with 4,680 nucleotides. The rAAV genome contains rep and cap genes which encode for the proteins involved in replication and capsid formation. These genes are flanked by viral inverted terminal repeats which are 145 bases in length and form a T-type configuration . Interestingly, rAAV vectors only need the inverted terminal repeats in cis for replication, packaging and integration [11–14]. There are 6 serotypes of rAAV which differ in their capsid proteins and thus their tropism for different target cells. rAAV-2 is the most common serotype used in gene therapy experiments and is the one used in this experiment. There are several features that make rAAV an attractive vector for gene therapy protocols. First, rAAV has the ability to remain expressed throughout the full life cycle of a cell by integrating into host cell DNA or remaining episomal inside the cell. Wild-type adeno-associated virus has been shown to integrate into chromosome 19 in the host cell by non-homologous recombination mediated by the rep gene products which are part of the rAAV genome [15, 11]. Recombinant rAAV which lacks the rep gene has been shown to integrate nonspecifically into host cell DNA or remain episomal. In either case, the rAAV genome is persistently expressed using the host cell's machinery . This feature is important in gene therapy because it could allow for a single injection of a therapeutic gene without the need for re-administrations. It is well known that repeat administrations of a vector can lead to neutralizing antibodies against the transgene rendering it ineffective. Secondly, rAAV has broad transduction capabilities because it is able to transduce many cell types including the lungs, neurons, muscle, intestine and hematopoietic cells . In addition, rAAV can transduce mitotic and postmitotic cells . At the time of our injection, we know that the stem cells in the lung and intestine are undergoing rapid differentiation and proliferation and therefore are easily able to be transduced by rAAV. Third, rAAV is an attractive vector because it is safe as compared to other viral vectors. 96% of the genome is removed when preparing rAAV vectors because only the inverted terminal repeats are needed for viral replication, packaging and integration. In addition, for rAAV to enter the lytic phase of its life cycle it requires infection with a helper virus such as adenovirus or herpes simplex virus. Otherwise, it remains latent inside the host cell. Others have reported the use of rAAV for in utero gene therapy experiments and have shown long-term expression of the transgene product in target tissues for 3 months to 18 months . Recently, this laboratory demonstrated in long term expression of rAAV vectored transgenes in multiple species . Ciliary neurotrophic factor (CNTF), a biologically active gene, was used in this experiment to demonstrate physiologic changes in our laboratory animals after in utero gene transfer. CNTF is a well-known nerve growth factor which promotes survival and differentiation of neurons. In addition, CNTF promotes weight loss and a decrease in water intake in laboratory animals when given systemically [20–23]. Weight loss in CNTF-treated animals is secondary to a decrease in skeletal muscle, adipose tissue, glucose and triglycerides. At 15–16 days gestation, timed-pregnant Sprague-Dawley rats (Harlan-Sprague-Dawley, Indianapolis, IN) were anesthetized and the fetuses surgically exposed for injection via amniotic fluid with replication defective rAAV. Three different doses of the replication defective rAAV vectors were injected: high, medium and low dose groups with 2.5 × 109 pfu/ml, 2.5 × 108 pfu/ml and 2.5 × 107 pfu/ml of virus, respectively. The control fetuses were not injected. The construct used in this experiment was rAAVcntf-gfp, an rAAV recombinant carrying the cntf and gfp genes with a cytomegalovirus promoter. There was an internal ribosome entry site (IRES sequence) placed between the two transgenes. The construct was shown to produce a polycistronic message, thus production of the CNTF and GFP protein are co-expressed . A total of 39 rat pups were studied over six months. The high dose group included 9 animals (5 males, 4 females); the medium dose group, 15 (7 males, 8 females); the low dose group, 6 (3 males, 3 females); and the control group, 9 (6 males, 3 females). Weight in grams was measured at day of life 10, 30, 50, 90, 114 and 120. Water intake was measured in milliliters over an eight week period at day of life 90, 97, 104, 111, 118, 125, 132 and 139. Food intake was measured in grams over an eight week period of time at day of life 90, 97, 104, 111, 118, 132 and 139. Analysis of variance (ANOVA) with repeated measures was used for statistical analyses. All males and females underwent the same protocol. Males and females were analyzed separately. Protein was extracted from lung tissue samples using 10 times volume 1X Laemmli sample buffer with 100 mM PMSF, sonicated, boiled and the supernatant was aliquotted into new tubes. Protein determination was done using the Sigma Kit with bicinchomnic acid Solution and copper (II) sulfate pentahydrate (50:1). Samples were placed in a spectrophotometer and protein concentration was determined. 20 micrograms of protein from each sample was placed on a 10% SDS-PAGE gel and run at a constant current of 30 mA. The proteins were then transferred to a nitrocellulose membrane using a semi-dry electroblotter at 10–14 volts for 1–2 hours. 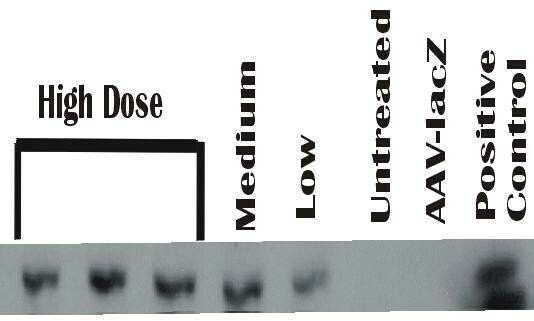 The western blot protocol was ECL from Amersham Life Sciences. First, the membrane was blocked overnight with 5% Blotto at 4°C. In the morning, the membrane was washed with 10 mm Tris-borate, 0.15 M NaCl (TBS)-Tween (0.1%) and primary rabbit anti-GFP was allowed to incubate with membrane for three hours. This was followed by a second wash step with TBS-Tween (0.1%) and then incubation with a peroxidase-conjugated anti-rabbit. The membrane was washed, incubated with ECL reagents, and exposed to X-ray film. Equal loading of samples was confirmed by using alpha-tubulin. CNTF reduces weight as a primary effect on the physiology in mature animals. Thus, animals treated in utero with the rAAVcntf-gfp construct at 15–16 days gestation were weighed at regular intervals. Three different doses of virus were used varying from 2.5 × 107–109 pfu/ml of amniotic fluid. As shown in Fig. 1, both females and males demonstrated a statistically significant difference, <0.0001 and <0.005, respectively in weight throughout the six months in the treated animals compared to controls. For males, the difference in weight began at 90 days. 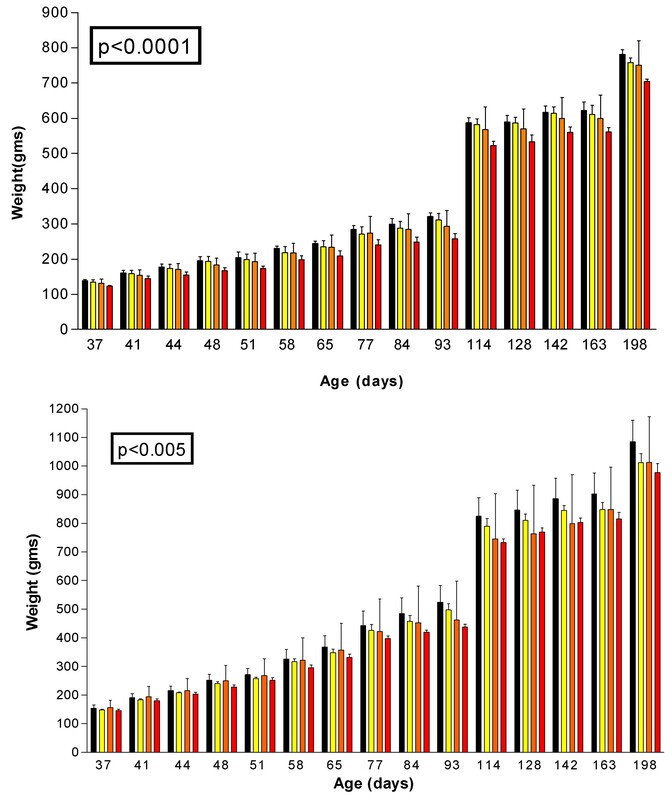 In contrast, a difference in female weights was observed at 50 days. Clinically, for both males and females, the response in gene expression was dose-dependent with the greatest inhibition at the high dose and least inhibition at the low dose. During the course of these experiments it was noted that the treatment group appeared to consume less water than the control animals. Thus, over a 7 week period beginning at 111 days of age, water intake in control and treatment groups was measured on a weekly basis. The difference in water intake in females compared to controls was statistically significant at a significance level at all doses at a p = 0.001 (Figure 2A). 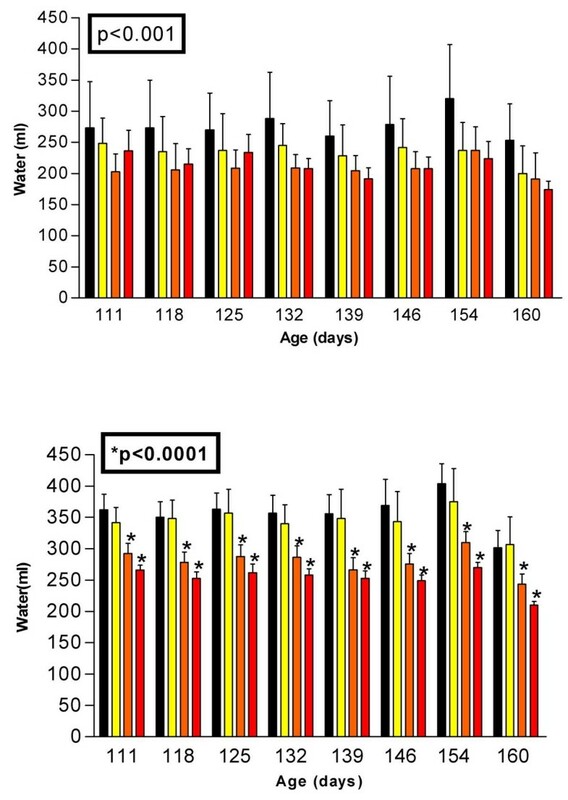 In contrast, a dose dependent water intake effect was noted in males (Fig. 2B). Only the medium and high doses of rAAVcntf-gfp therapy yielded statistically significant decreases in water intake (p < 0.0001). A similar dose response was noted in females, as well. Food intake was measured during the same time period as water intake and no statistically significant difference was observed between treatment groups. Because rat and human CNTF might cross-react, expression of the viral transgenes was documented using GFP levels from the polycistronic mRNA produced from the rAAVcntf-gfp construct. As shown in Fig. 3, GFP was readily demonstrated in protein extracts from the lung. In addition, GFP was found in the kidney where it is filtered from the circulation (data not shown). These results are consistent with our previous published report  demonstrating long term expression of transgene following in utero rAAV gene transfer. In utero gene transfer is a proven model for effective gene transfer and expression [1–3, 5]. Currently, researchers in the field of gene therapy are attempting to develop techniques to transfer genes to somatic cells and provide long-term genetic expression. Previously, we demonstrated that in utero rAAV gene therapy could sustain expression of transgenes for over 1 year in mice rats, and primates. Data presented in this paper demonstrated that in utero gene transfer with rAAV provides systemic physiologic effects of our transgene product and long-term expression of genetic information. This is clearly evident by using a biologically active gene and observing weight loss and a decrease in water intake in our treated rats compared to our controls over a six month period of time. We did not observe a significant difference in food intake in CNTF-treated pups as compared to controls. This is consistent with previously published reports involving the systemic administration of CNTF [20–23]. In these experiments, CNTF-treated rodents demonstrated a decrease in weight and water intake but no significant difference in food intake as compared to controls. Given these data and our previous reported long term expression of reporter genes using rAAV , this method of in utero gene transfer with rAAV can be useful in treating metabolic diseases by providing long-term gene expression. A number of experiments involving in utero gene transfer with rAAV, however, have not resulted in significant long term expression for a number of reasons. Boyle et al. demonstrated gene transfer into rabbit pulmonary epithelium using rAAV which lasted only 24 days. Their observed short term expression can be attributed to injection of the fetuses during the late saccular phase of lung development which the authors acknowledge in their paper. We have clearly demonstrated in this paper and previous work that the optimal time for in utero gene transfer is during early lung development in order to optimize the number of undifferentiated stem cells present in the pulmonary and intestinal epithelium which promotes vector uptake and gene expression. This time point is during the early cannalicular period of lung development which occurs at 15–16 days in rodents and at 10–20 weeks gestation in humans. In utero rAAV gene therapy can be used to achieve long term expression of metabolically active genes. As shown previously , these gene products are released into the general circulation to elicit a sustained physiologic effect. Therapeutic applications to human metabolic disorders diagnosed in utero may be feasible. This work was supported by funds provided by the Ochsner Clinic Foundation. JCC and JEL conceived and carried out all experiments in the project. DJG performed all the experiments.